Most people think of potatoes as a winter food, but I love them when they are young and thin skinned in the summer. We planted trench upon trench of potatoes in the spring and in the past few weeks have started harvesting new potatoes. Most people think that new potatoes are just small, red potatoes, but genuine new potatoes are harvested in the summer and have such delicate skins that you can rub them off. These potatoes are the ones you want use in your summer cookout potato salad or throw in a crab or shrimp boil. In general, I like all types of potato salad, but in the past few years have started to favor ones with a mustardy vinaigrette as the base, instead of mayo. 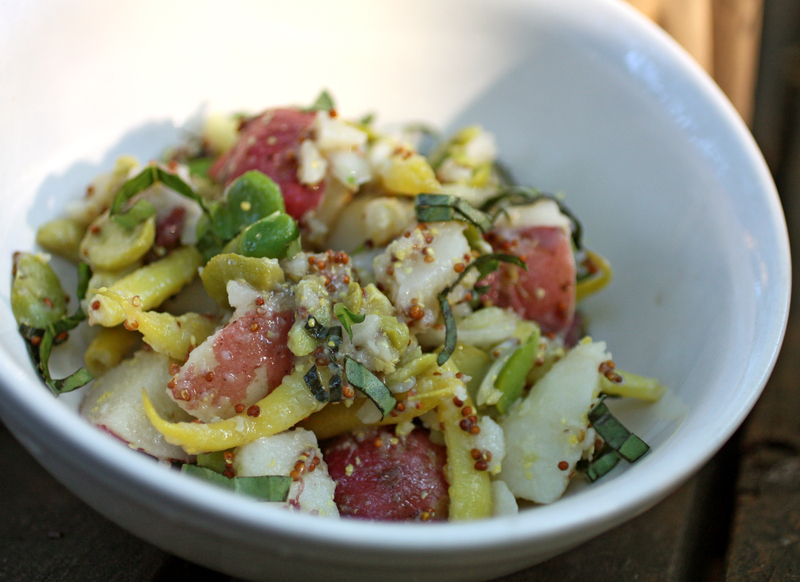 My current incarnation uses large chunks of potatoes, lightly blanched snap beans, and fava beans. This salad bridges the early summer produce (favas) and high summer produce (beans) and uses up all of those bits of green herbs you have. 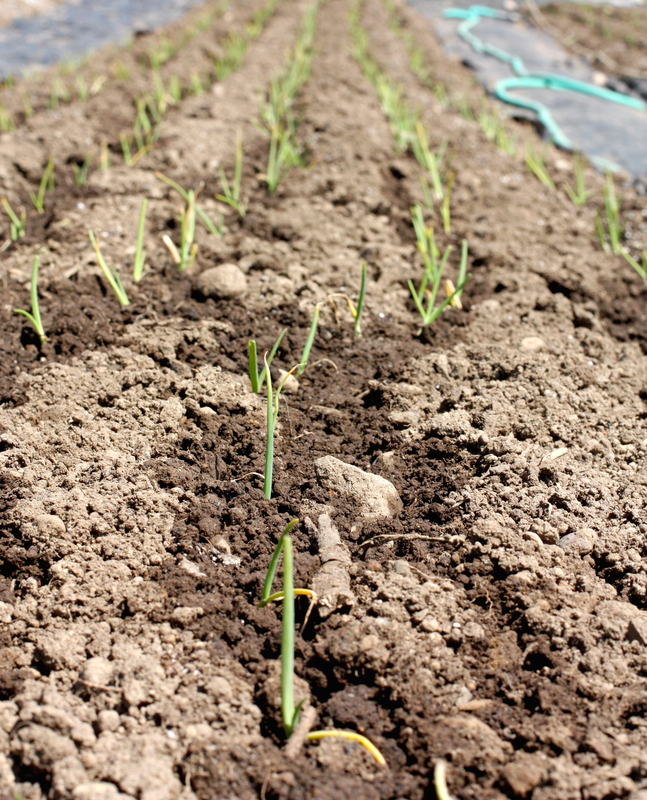 Scallions, parsley, basil, and cilantro are all welcome additions here. If you do not have any favas, fresh (or frozen) lima beans or butter beans would be tasty. Place the cubed potatoes in cold water with a handful of salt in a large pot and bring to a boil. When tender, scoop potatoes out from the pot, reserving the water. Bring the water back up to a boil and blanch the snap beans for maybe 30-60 seconds, scoop out from water and plunge into an ice bath or run under cold water. Drain and set aside. Bring the blanching water back up to a boil again and blanch the favas. Drain the favas when they are tender and pop then out of their skins. In the bottom of a large bowl, whisk together the garlic, mustard, vinegar, olive oil, and salt and pepper to taste. Add the potatoes, beans, favas, and onion and stir to coat. Fold in the chopped herbs and serve warm or cold. Finally, real summer time weather! More and more crops are being harvested now, including blueberries, summer squash, cucumbers, and peas! Sugar snap peas are the most popular pea by far, but I really like fresh shelling peas. Earlier this summer, we went on a short trip to Chicago. One evening, I had the delight of eating a pea soup at Hot Chocolate. 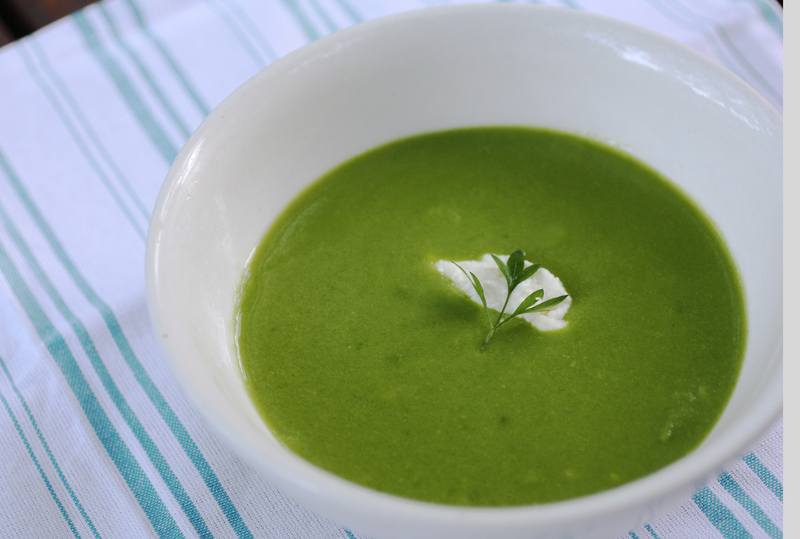 I was determined to recreate this soup when we were ready to harvest our shelling peas. The most important thing about this soup is that you need to buy fresh shelling peas! Make sure that they are freshly picked to insure the highest sugar level. After you pick peas, the sugars gradually start to turn into starch. This summertime soup is sort of like “nose-to-tail” cookery for vegetables. After you shell the peas, reserve the pods to make a light green broth and then you cook the peas in their own broth! Simple, fast, and very tasty. Place the pea pods in a large saucepan. Cover the pods with water and add the bay leaf and a large pinch of salt. Bring this up to a boil and turn down to a simmer. Simmer the broth until the pea pods are soft, maybe 15 or 20 minutes. Strain and transfer the broth to a bowl or another pot. Melt 1 tablespoon of butter in a large saucepan and gentle saute the two garlic scapes or garlic clove. Add the peas and continue to cook for a couple of minutes. Cover the peas with some of the pea broth. You will most likely not need all of the broth. Simmer the peas for about 5-8 minutes and remove from heat. Blend with an immersion blender or transfer to a blender and puree until smooth. The soup should be quite thin. In a small bowl, mash together 1 tablespoon of butter and 1 tablespoon of flour. Bring the soup back up to a high simmer and whisk in the butter/flour mixture. Continue to cook until the soup thickens. Taste and season. Ladle into bowls and serve with a drizzle of cream, yogurt, or formage blanc. Enjoy! A lot has happened since the last time I posted! Busy times on the farm! 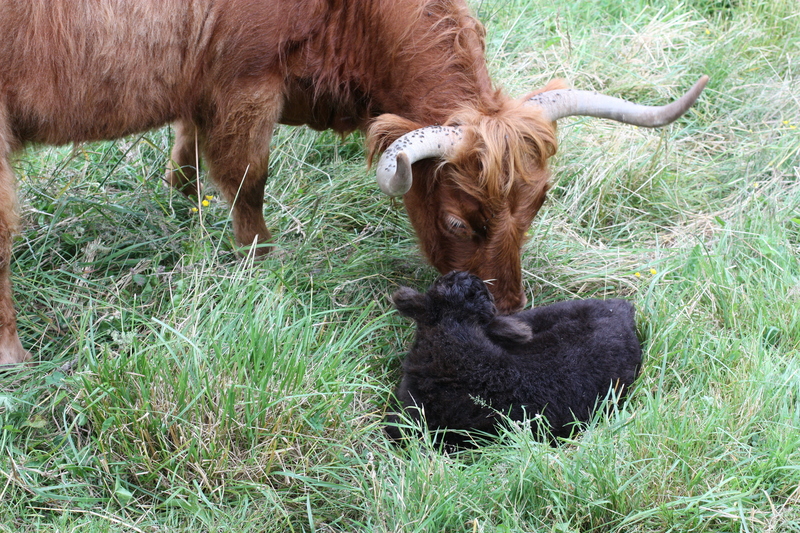 A new calf was born on Saturday morning! And local Vashon strawberries are back in season! I bought a couple pints of strawberries at the market yesterday and some got turned into this year’s first shortcake. These shortcakes were the culmination of our mostly local meal over the weekend, including the roasting of one of the broilers! We roasted the chicken over some of our turnips and radishes, tossed together a simple salad with avocado and sunflower seeds, and made a gravy out of the giblets from our chicken. But my favorite part of the meal was the strawberry shortcake. 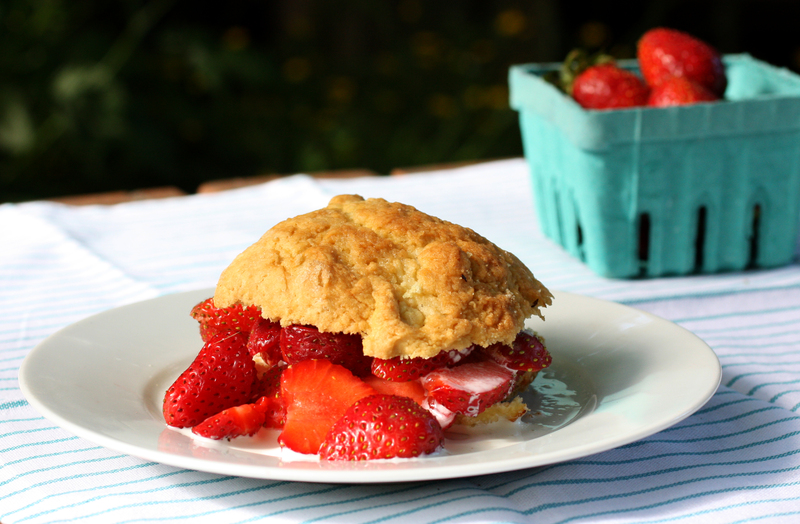 Shortcakes are really just slightly sweet biscuits and are quite forgiving. 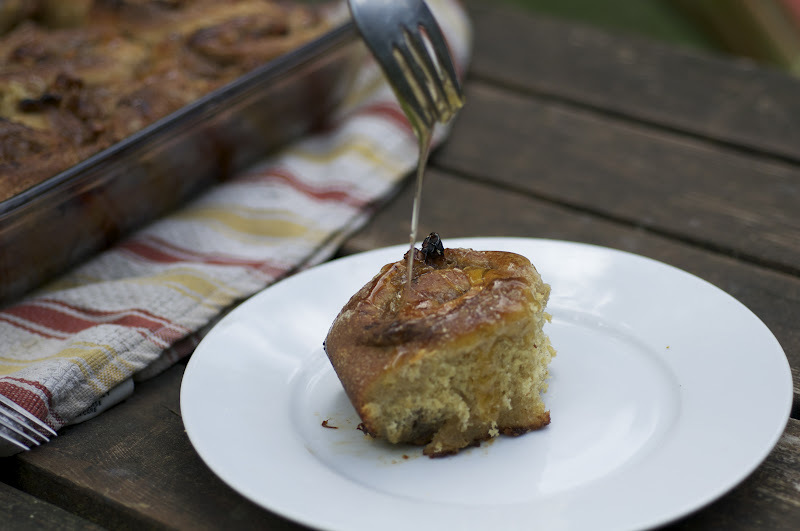 This recipe is easy to multiple and are decidedly rustic. Recently, I have been including almond flour in a lot of my baking. It tends to give baked goods a denser, fine crumb, but is not gummy. Almond flour is also great to have on hand for gluten free baking! These would be even better with fresh, barely sweetened whipped cream or whipped coconut cream, but we used some half and half to add some moisture and richness to the shortcakes. 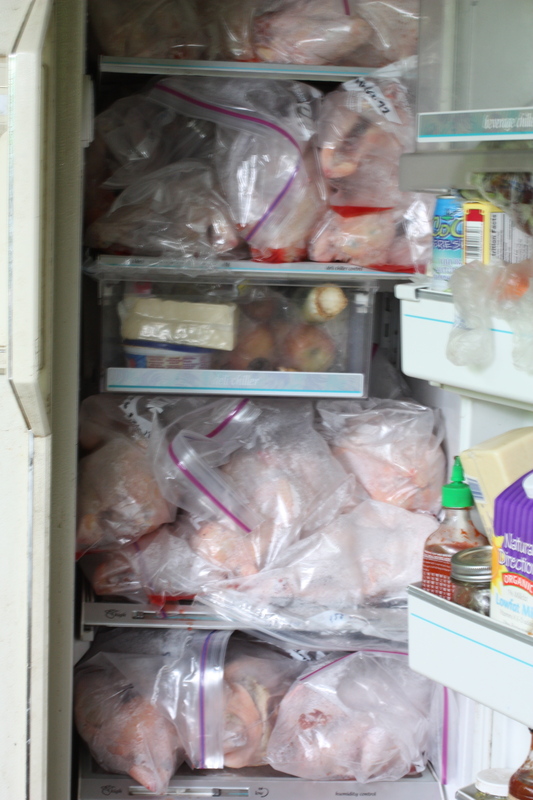 Over the season, fill with whatever fruit you have on hand; peaches and nectarines would be lovely, as would any other berry. Preheat oven to 425. Grease a baking sheet. Trim and hull your strawberries. If they need a bit of a flavor boost, toss them in a bit of sugar and vanilla extract. Another option is to toss them in sugar and balsamic vinegar for an interesting twist. Combine flour, almond flour, salt, baking powder and soda, and sugar. Cut in the butter until the mixture resembles damp sand. Whisk together the milk and egg. Gradually stream in the milk mixture into the flour mixture. Fold until just combined. You may or may not need the entire amount of the milk mixture. Turn the dough out on a floured board and shape into a 12″x6″ rectangle. Cut the dough into 6 shortcakes and transfer to the sheet. Brush with milk and sprinkle with sugar. Bake 12-15 minutes or until done. Cool shortcakes on baking sheet. When ready to serve, split each shortcake and fill generously with berries and whipped cream or a drizzle of half and half. Enjoy! Oh, rhubarb. Often the first sign of spring, rhubarb emerges with fat, ruby-pink stalks and huge leaves. Over the past few weeks, any baking that I have done has included rhubarb. 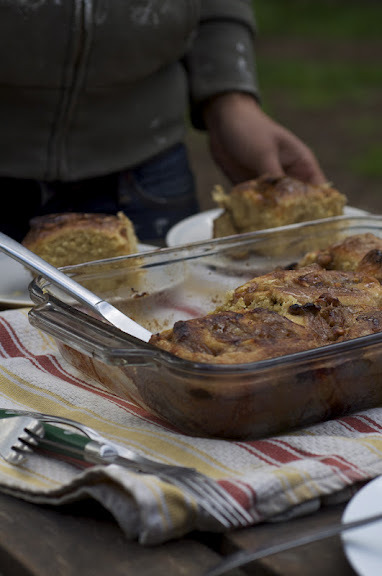 These sticky buns were a favorite among our group of Tuesday workers. Use this sweet dough recipe or your favorite sticky bun dough. I happened to use 3/4 whole wheat pastry flour and 1/4 white flour with good results, but if you want ultimate fluffiness, use all white flour. A bonus: the dough rises overnight so all you have to do is roll it out, fill it, and let it have its second rise and bake before you have a tasty breakfast, second breakfast, or morning snack. Rhubarb should be in season now at markets in the northwest; I’m not sure how the season is going in the unseasonably mild northeast at this time. If not, you can swap out the rhubarb for whatever fruit suits your fancy. In the summer, blackberries would be super delicious! In a small bowl or measuring cup, whisk the yeast, milk, and sugar together. Whisk in the eggs. In a separate bowl, combine the flour(s) and salt. Add the liquid mixture to the flour mixture and stir until it comes together. Gradually, add small pieces of soft butter until it is all incorporated. Turn dough out on to a floured board and knead until the dough is smooth and elastic, but not really sticky. Place in an oiled bowl and cover with a towel. Place in a fridge or a cool-ish place for an overnight rise OR let dough rise in a warm area for about 2 hours (or until doubled). In a medium saucepan, cook the rhubarb and sugar together until soft and thickened. You may need to add a slash of water to get everything started. Stir in the vanilla bean, if using. Or, turn off the heat and add the vanilla extract. Cool. Punch down the dough and turn out onto a floured board. Roll dough out to a rectangle, roughly 12″x16″. Spread the dough with the softened butter and spread on the rhubarb filling, leaving a 1″ border. Sprinkle on the chopped walnuts. Roll the rectangle up and try to get the seam side down. Slice the roll with a sharp knife into 9 or 10 even rolls. Place the rolls in a well butter dish and sprinkle with a bit more sugar. Cover with a towel and let rise in a warm place for about 45 minutes. At some point, preheat your oven to 350. When the buns have risen, bake for 30-40 minutes or until cooked through. Remove and immediately drizzle with honey to taste. Serve warm! Photos by Taylor, the other farm intern. Spring has truly sprung! In the last two weeks, we started harvesting the first new crops of the season. Deliciously tender and sweet asparagus! Juicy spinach! Definitely a welcome change to all of that kale we have been eating. During last Friday’s harvest I picked about 7 pounds of spinach. 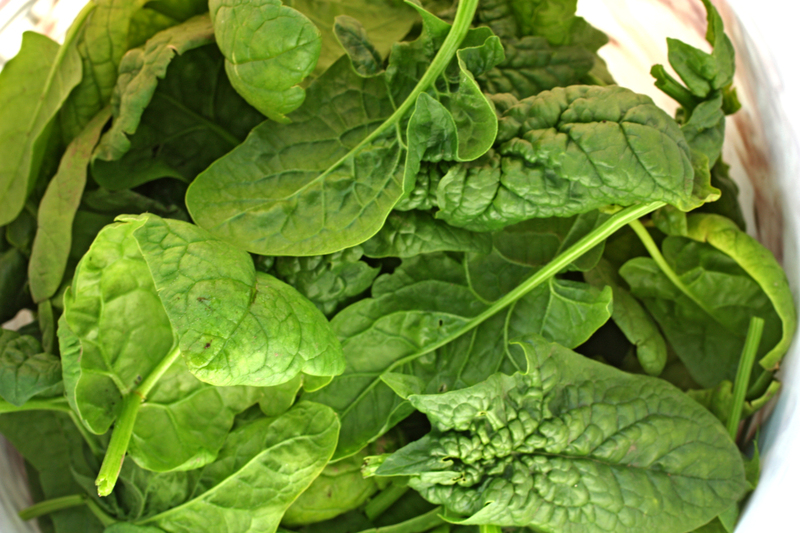 It is sort of crazy to think that I touched every single leaf of spinach that was sold. On the agenda for this week: finish planting thousands(!) of onion starts and putting the plastic on the new hoophouse. The weather forecast is surprisingly wonderful so it should be a great week. Coming up: rhubarb cinnamon rolls. Sorry for the lack of updates lately! The internet has been a bit wonky for the past few weeks. 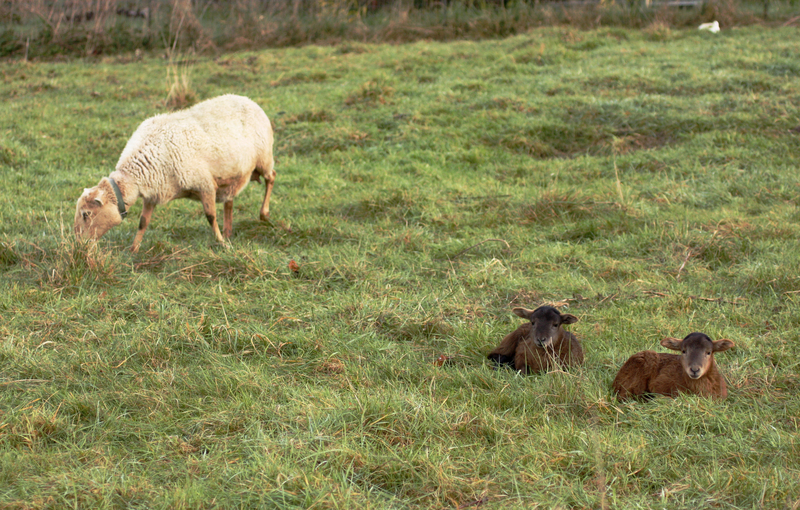 Food on the farm right now is still a bit monotonous. Lots of kale, kale florets (taste like broccoli! 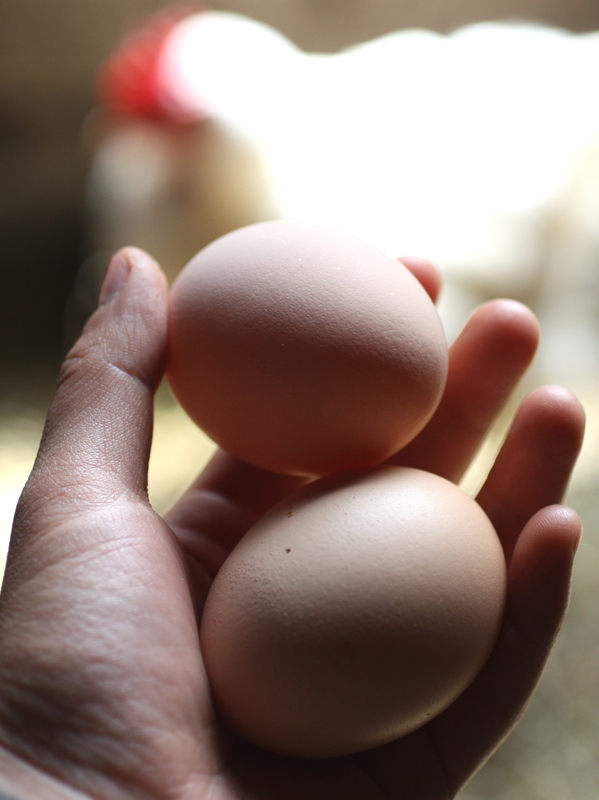 ), and eggs. 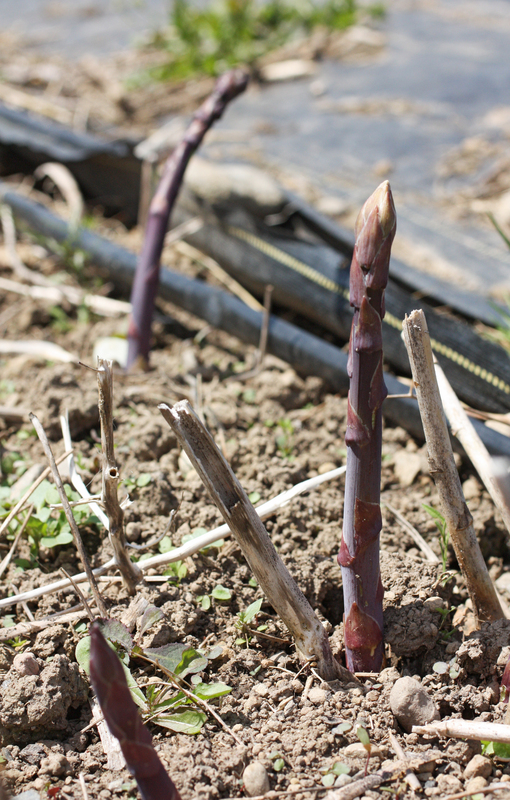 However, we harvested our first bunch of asparagus last week and the rhubarb is coming in strong. Spinach is nearly ready for harvest and we trellised the first succession of peas today. Spring is definitely in the air! Lunch is an important event of the day. These are two sandwiches that I have eaten a couple of times now and highly recommend these combinations, especially if you have access of farm fresh kale and eggs. Saute a generous handful of kale (or kale florets if the kale is bolting fast) with a small clove of smashed garlic and a pinch of red pepper flakes. When the greens are wilted, add a splash of apple cider or balsamic vinegar and pinch of salt. 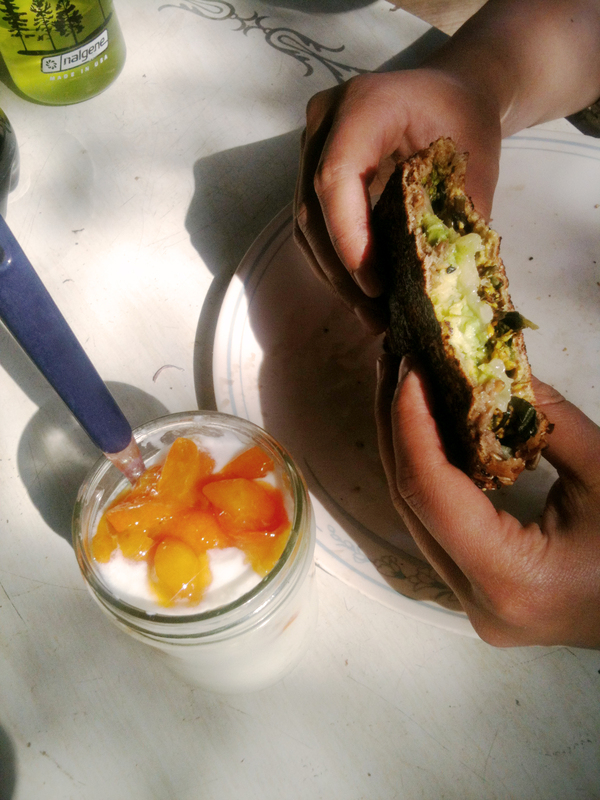 Stuff the greens into your favorite grilled cheese sandwich; mine has a layer of grainy mustard and half an avocado. Enjoy! Here, I enjoyed it with a side of yogurt with kumquat marmalade. This was the first time I have made mayonnaise/aioli by hand, and I have to say that it was way easier than I expected. Just keep whisking! Or, use an immersion blender. I used a couple of egg yolks because mine were small and used half olive oil and half vegetable oil. Also, I know everyone knows how to hard boil an egg, but I like to bring the eggs in cold water up to a boil, remove from the heat, cover with a lid and let stand for 10 minutes. This results in a perfectly cooked white and a still slightly soft yolk. 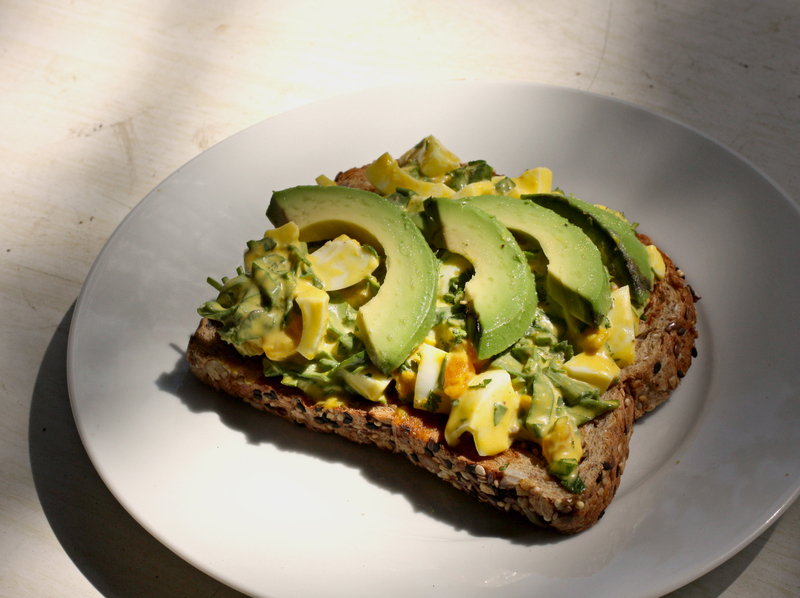 For two sandwiches, hard boil four eggs. Cool, peel, and chop coarsely. Combine the eggs with a spoonful of mayo, a dollop of mustard, and small handfuls of finely chopped herbs of your choice. I used chervil (tiny, fine leaves with a slight licorice/anise flavor), parsley, cilantro, and sorrel (large-ish leaves with a lemony tang). Season well with salt and pepper. Serve on grainy bread, open faced or not. Once again, I added slices of avocado on top. It has been two weeks since I’ve moved to the farm. Everyday is different, but there is a general routine that we follow. 6.30-6.45am: Wake up to all of the roosters crowing. 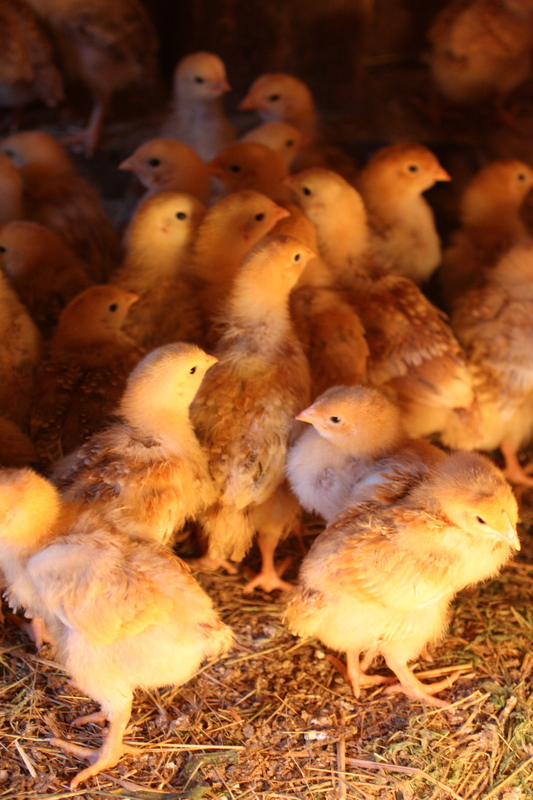 And crowing and crowing. 7am: Head out to do the morning animal chores. 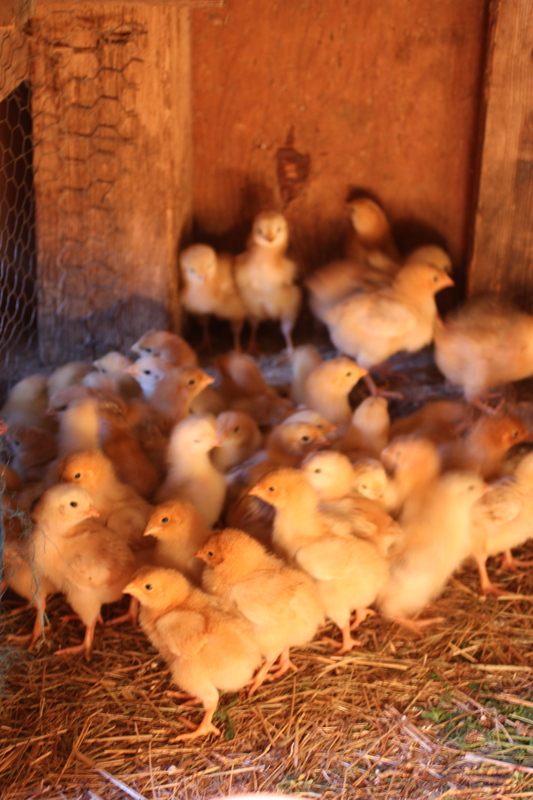 Check on and feed and water the chicks. Give fresh hay to the cows. 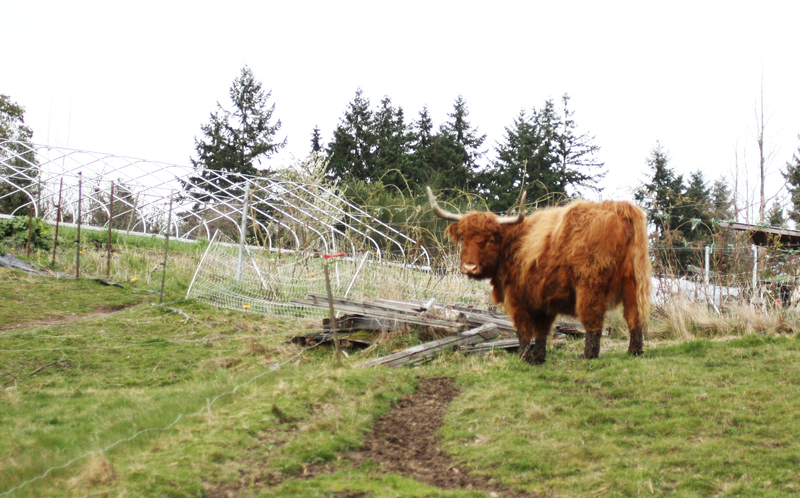 Golden, who is expecting a calf this summer. Feed and water our three chicken flocks. 7.45-8am: Breakfast! 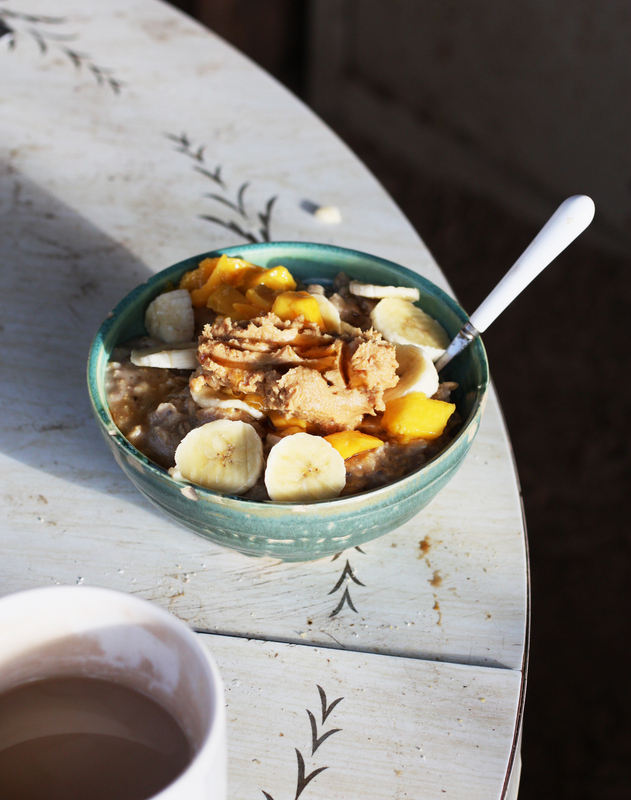 For me, hot oatmeal and tea. 9.30am-1pm: Morning work. Two days a week are harvest days. We could be building the new hoophouse, sowing in the greenhouse, prepping new beds, etc. 1pm-2pm: Lunchtime! Usually something with an egg on top. 2pm-5.30pm: Afternoon work. Sometimes similar to what we did in the morning. More sowing, transplanting seedlings outside, working on smaller building projects. 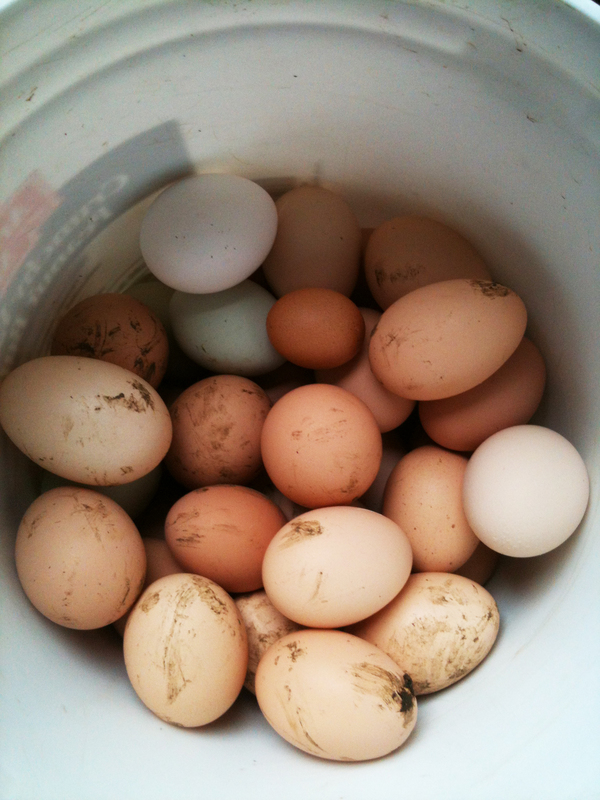 Afternoon egg collection. After we finish work, I might go for a run, ride my bike into town, or do some yoga. We alternate cooking dinner each night and drink lots of hot tea as the sun goes down. At night, I’ll usually knit and listen to npr or podcasts. Everyday is different, mostly fun, and full of good work. This week, there was sun almost everyday! Spring is definitely in the air. a gardener, home cook, jam maker, and future farmer in seattle, wa.